Oct. 11th, 1943—A British spy plane crashes in Nazi-occupied France. Its pilot and passenger are best friends. One of the girls has a chance at survival. The other has lost the game before it’s barely begun. 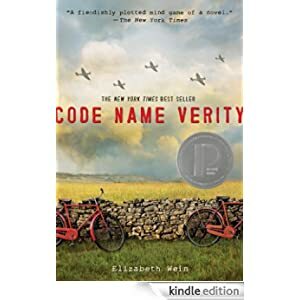 When “Verity” is arrested by the Gestapo, she’s sure she doesn’t stand a chance. As a secret agent captured in enemy territory, she’s living a spy’s worst nightmare. Her Nazi interrogators give her a simple choice: reveal her mission or face a grisly execution. As she intricately weaves her confession, Verity uncovers her past, how she became friends with the pilot Maddie, and why she left Maddie in the wrecked fuselage of their plane. On each new scrap of paper, Verity battles for her life, confronting her views on courage, failure and her desperate hope to make it home. But will trading her secrets be enough to save her from the enemy? This historical fiction novel is for teens and is selling for only $1.99 today.